On a classic New England fall day—11/9/13 to be precise—I had the privilege of presenting and signing at the 2nd annual Pequot Library Children’s Book Festival in Southport, CT.
Returnees from the first annual (2010) comprised Jennifer Berne and me. 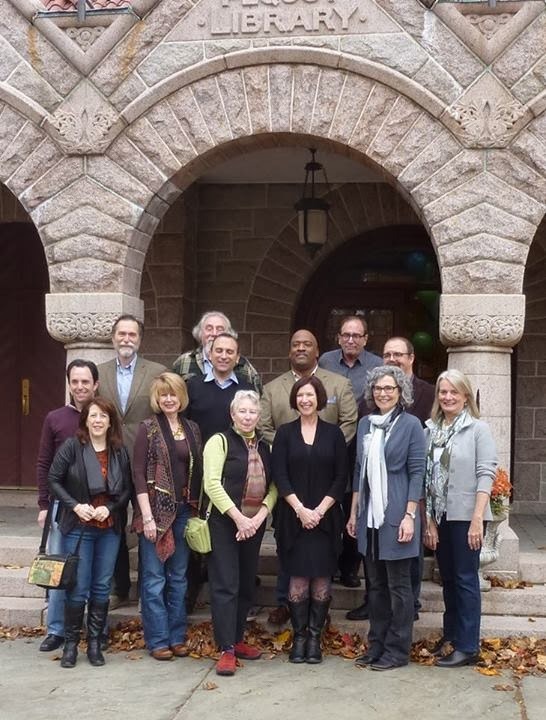 Old friends/new participants included Mike Rex, Ann Haywood Leal, Laura Toffler-Corrie, and Bruce Degen. Among those I had communicated with but not met until now included Dan Yaccarino and Bryan Collier (and I caught snatches of both of their fun presentations). Last time, Susan Hood organized it; this time, she attended as an author. Photo courtesy of Craig Kennedy. Thank you again to MaryJo Koeck for running the show with charm and calm. Bill Finger in "Heroes of the Comic Books"